Sometimes you get lucky and the food you make is both healthy and beautiful. This stuffed pepper dish uses chicken breast instead of sausage and a lot of color to induce reluctant people to eat it. When I say “people”, I mean two children who complain that their mother tries to feed them vegetables all the time. I like this because it is portion controlled and super tasty. A dash of hot sauce, you could melt some cheese, slice some avocado for the top, toss in your lunch box – whatever you want! This is off the charts good for you as well. It is high in niacin, viamin A, B6, and C. How can you lose? Preheat oven to 375 degrees. Heat vegetable oil in a large sauté pan and cook onion and garlic until onions are softened. Add chicken, chili powder, cumin, and paprika, and sauté until chicken is cooked through about 5 minutes. Take pan off the heat and mix in rice, tomatoes with juice, black beans, and frozen corn. Slice bell peppers in half and core them. Stand them in a 13x9 casserole dish and fill with chicken mixture. Add ¼ inch of water to the casserole and cover. 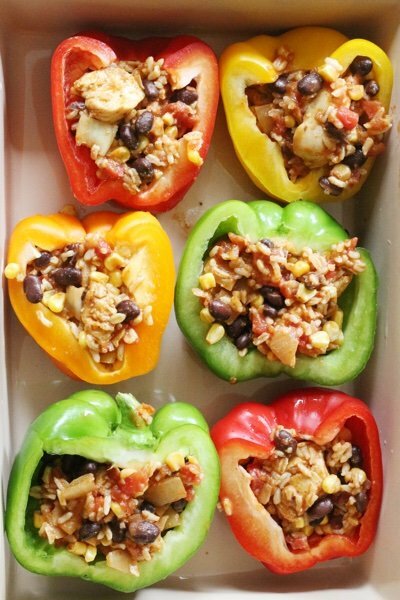 Bake for 45 minutes or until peppers are softened. This looks great, will be eating this soon. Always find my peppers take a very long time to soften. Do you cook them prior to baking? I have tried a lot of ways in the past but never really satisfied. @Karen - they do take forever and you can boil them before baking. I tend to stay away from that step because I am lazy. Good point! Your peppers look amazing! Love the color! I absolutely eat by color even at breakfast. Ok, I've prepared stuffed peppers for decades [I'M 67] beginning with traditional beef-rice but evolving to a healthier meatless version which we all prefer here for the simple reason that we feel better afterwards, not heavy, logy or sluggish. I use mushrooms, oyster mushrooms when available to replace meat, brown rice, egg, parm, garlic, onion, celery parsley and varied beans or lentils. After stuffing I surround them half-way with crushed tomatoes and bake covered til peppers are done [about 45mins]. The resulting pepper-y tomato sauce is so fantastic over mezze rigatonis with more parm. So I guess mine are more italian than mexican :) I've always served my st. peppers with pasta because of the sauce. My old-school method of stuffing the whole pepper with a stem-hat is still my best way. That method uses a large wide pot to have peppers wedged in upright, sauce added up to top of pepper and simmering for an hour or so. 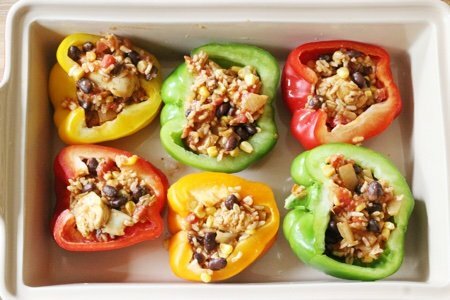 This is a great Fall dinner with native peppers and easy to freeze single servings for lazy nights. Always make extras! I have to try your mexicali version someday. Thanks Lisa! Do you know if these would freeze well if they were baked first?